The District Department of Transportation worked with EastBanc Technologies to develop a custom solution for tracking and maintaining visibility into the location and movement of DDOT’s network of buses: TRANSITiQ. The District Department of Transportation (DDOT) is an agency of the District of Columbia government that manages and maintains publicly owned transportation infrastructure across Washington, D.C.
Tracking and maintaining visibility into the location and movement of DDOT’s network of buses is crucial to helping the agency achieve sustainable travel practices and energy efficiency. In order to reduce costs and boost performance, the agency sought to modernize and complement its existing capabilities. DDOT worked with EastBanc Technologies to develop a custom solution: TRANSITiQ. It is a business intelligence tool for public transit agencies. Using a smartphone-based Global Positioning System, the Internet of Things and cloud technology, the system provides a 360-degree view of individual vehicles and DDOT’s overall bus fleet (location, speed and direction). The system automatically scales to handle peak traffic times and a surge in position reports – without interruption or delay. Information about fleet movements is reported in an intuitive, dashboard-based format. The system helps to increase rider satisfaction, prevents delays or bunching and optimizes transit coverage. The system enables cost-savings over legacy, hardware-based systems. It also allows DDOT to track the location of buses more reliably. TRANSITiQ works across multiple platforms – Apple iOS, Windows, Android, etc. It has been implemented in the agency’s existing smartphone contracts. Because the system is a software as a service offering, DDOT benefits from enhancements or upgrades at no additional charge. The company also provides DDOT with mobile applications, trip planning screens and bus stop displays. 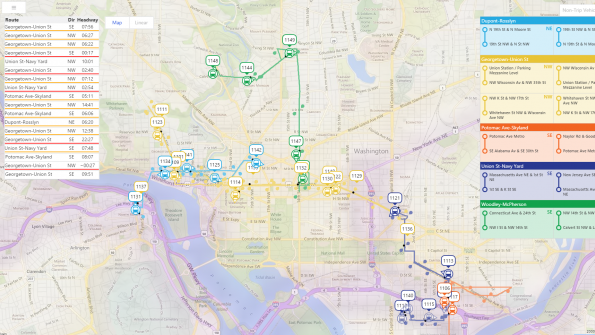 This provides transparency to riders in the form of real-time data and situational awareness of DDOT's transportation network, wherever they are. “The solution, based on Microsoft cloud technology, enhanced our ability to track and measure bus operation performance with the aim of improving operations and the customer’s experience,” says José Colón. He is chief information officer at DDOT, in the Washington, D.C. government.